The late LEE HAZLEWOOD is one of R&R and Pop's most iconic cult figures, with a huge reputation as a producer, songwriter and singer. This 35-track compilation presents an eclectic selection of rarities, juxtaposed alongside a handful of his early hits. 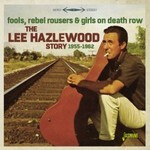 Hazelwood's early productions are particularly collectable, notably his own recordings. Included herein are his five earliest known demo's, from 1955/56, which highlight his distinctive, resonant baritone. Apart from Hazlewood himself, featured artists include Duane Eddy, Sanford Clark, Al Casey, Ray Sharpe, The Sharps, Barbara Dane and Ramona King. This compilation is a mandatory purchase for all Lee Hazlewood collectors/completists.